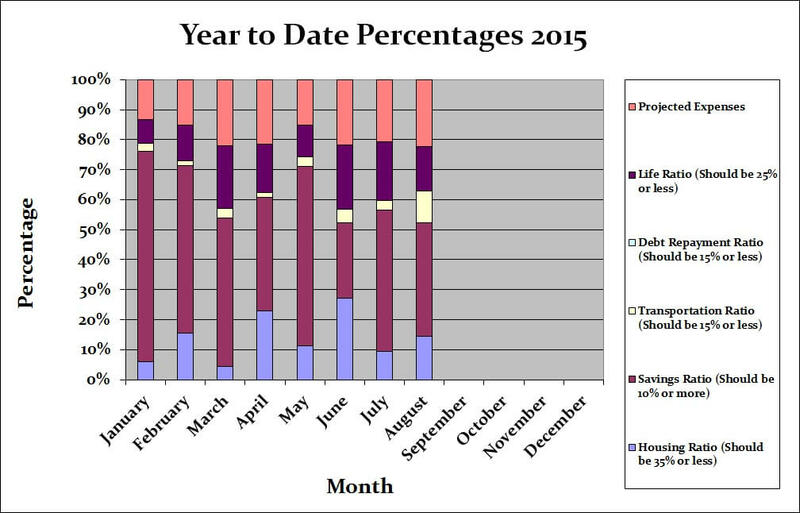 When should a monthly budget be evaluated? This seems to be the hot question the last few months of every year in my inbox. I wish I had all the right answers for those fans who want to become debt free and put all their financial worries behind them. In all honesty money concerns never end but what I do have is our experiences to share. If you haven’t realized it yet you will notice that everything to do with your money will change as will the way you think about your finances. Over the years we have found that we change the way we think about our money and how we manage it. If you rely on a monthly budget to manage your finances a serious evaluation must be done at the end of the year. What does this mean? It means you look at every budget month for the year to see where you can make improvements. You will also be armed with numbers which is critical to the success of building a monthly budget for the new year. The first year we started our monthly budget we realized that we were constantly making changes. It may have been because our finances changed, our bills went up or down and so on. That first year of budgeting was hit or miss, essentially a trial budgeting year to see how it would work for us and how we could improve it. We knew we wanted to share our monthly budget with our fans but we needed to make sure it worked for us and ironed out all the kinks. Aside from clear changes needed what we noticed the most was that category figures were jumping all over the place and that’s what will happen if you if you check month by month. Not every month is going to be the same. This is when we came up with our projected expenses because not everything gets paid monthly. It will be clear that numbers will change but eventually even out over the course of the year if you follow your budget properly and forecast those expenses as best you can. It took a good year before we had a grasp on our financial numbers and what our spending patterns were like. No one can really have a static budget that will work 100%. Canadian Budget Binder fan Kendra emailed me the other day asking about our monthly budget because she has found that her budget hasn’t been balancing as well as she had hoped. She’s 6 months into her first year of budgeting and every month she is spending more than she had anticipated in her budgeted categories. You have to either stop spending money and sticking to that monthly budget number OR change it if you have the money to do so. You may also learn that the figures that you estimated are nowhere near the actual figures you are spending. You need to be realistic but this is why you need to evaluate your monthly budget yearly. Example: If you budget $15 for Tim Horton’s coffees each month but go every day of the week this figure is NOT realistic. You also can’t budget more than you earn so if you net $2000 monthly you can’t have a budget with categories totalling more than that number. You will never get it to balance if you don’t have enough money coming in and I see this all the time when I check fan budgets that are emailed to me for review. This is a huge reason your budget will never work. I honestly believe that Kendra should have enough data after 6 months to average the numbers for her monthly budget and see what the rest of the year brings her. 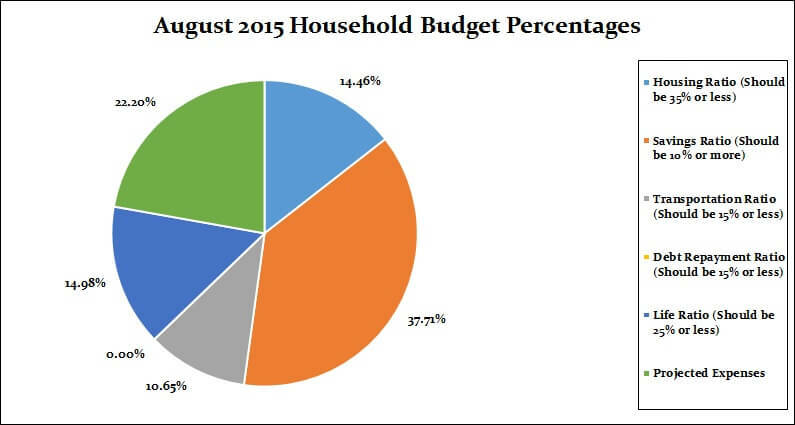 If you are budgeting for the first time 6 months of a monthly budget should help you forecast the following 6 months. After that first year evaluating yearly is a great way to monitor your category spending. You can even do mini-monthly evaluations which we do. 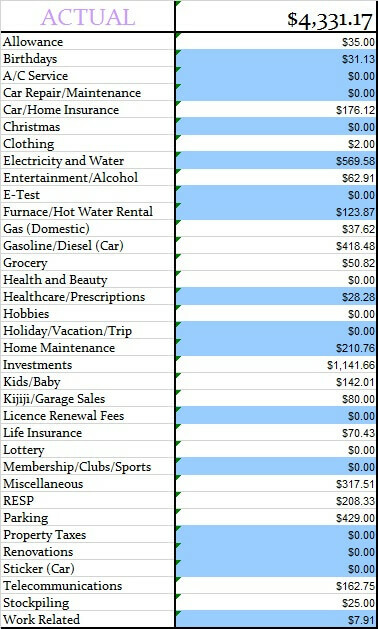 This is simply a scan of the monthly budget to see how we are doing without making any major changes. My wife and I do a yearly budget review in December every year and assess where we need to make changes if any. This is a big deal because it sets the standard for the new monthly budget. There are never any easy answers when it comes to a personal budget but if you want down to the wire accurate numbers you must be prepared to document everything. How often do you evaluate your monthly budget? Where did all our money go in August? This month was our lowest income month so far this year. Together with some extra bills this produced an average looking month as far as figures go. The Gasoline category was much higher than usual due to travelling around Ontario. We were also presented with our biggest electricity and water bill ever. I took a couple of weeks off of work, so that made a small difference because I wasn’t getting any overtime. I haven’t started my second job yet either but I bought a parking pass in preparation for the forth-coming season. Nothing truly out of the ordinary happened, but extra or larger bills than average can put a dent in your budget figures. Our savings of 37.71% includes savings and investments and emergency savings for this month. The other categories were well within the defined percentage limits. Our projected expenses this month is at 22.20%. Time for the juicy category numbers and to see how we made out with our monthly budget. Below you will see two tables, one is our monthly budget and the other is our actual budget for the month of August 2015. Finish sanding and stain our sons kitchen table and chairs- All I have left to do now is finish the table top and it’s done. I hope to have this done in September. Finish our sons free rocking horse (handle missing so I’m making one)- I’ll be working on this as soon as I can in September. Reach 4500 Twitter Followers- PASS! Reach 6650 Facebook Followers- PASS! Reach 2200 Pinterest Followers- PASS! Reach 3100 Followers The Free Recipe Depot Facebook-FAIL I haven’t put much effort into the page lately. I’ll get working on that more soon. Reach 175 Followers Bloglovin- FAIL This again is not a media source I’ve put much effort into but I’d like to see it grow. Finish the budget projected expenses- FAIL Eventually I will get it done. I have to! Help a new blogger with a task or question- PASS! Connect with a new blogger- PASS, connected with 3 new bloggers. Finish the master bathroom shower- Haha…that’s my answer! Pick out new tiles for bathroom and accessories (mirror, towel bar holder etc. )- Not yet! Buy a new blind for the garage- I’ve looked at second-hand shops but nothing yet. I might just have to break down and buy one new. Buy a used mirror for our master bathroom- PASS We Finally bought one from Canadian Tire of all places on sale too! Finish the walls in the baby room- FAIL, however we will be working on getting him into his crib next so I’ll be working on sorting his room out. Research and get quotes for a new fence- We’ve decided to wait until Spring 2016. Start looking at kitchen designs- We’ve looked online but nothing concrete yet. Start looking at pricing for a new insulated garage door- I’m working on this now. Box old baby clothes for storage- We’ve done most of this. Now we have a few boxes to sell. Sell baby stuff we don’t need- My wife will be working on this for September. Buy a pressure washer- Still waiting for a specific brand to go on sale. Buy an art easel for our son- PASS We got it for $5 used. It’s a gorgeous wood easel and I bought some chalkboard paint and updated one side to a chalkboard. We went to Michael’s and bought 2 rolls of paper and some chalk with the 40% off coupon. Plan a couple of weeks holidays for August- We did go away for a couple of weeks, yes! Start planning our sons first birthday party- PASS~ This is happening very soon!! Start a new monthly writing job- PASS!! I’m writing for She Knows Canada again! Do an oil change on the vehicle- PASS! That’s all for this month check back at the beginning of October 2015 to see how we made out with our September 2015 budget! Budgeting has been something that my husband and I have always done. I have always found budgets exciting (I love to save). I agree with you that budgets need to be revisited regularly to make sure you are on track and being realistic. My husband and I do a financial check in quarterly. We review our daily budget, and make sure we met our savings goals (we make commitments at the check in before) and decide how that savings gets invested based on our investment plan. It is pretty satisfying and keeps us really motivated. Good for you. We have been budgeting so long now that we check in often as well but we do a big overhaul at the end of the year too. I agree budgets are motivating. What budget do you use or did you create one? I really enjoyed looking over your breakdown, and reading through your budgeting series. I have been trying to adopt your spreadsheet for my wife and I, and I think starting in September I have finally managed to organize a system to make tracking purchases less daunting. What I was wondering is how you would recommend tracking any employer matched RRSP contributions. Both my wife and I contribute the max that our companies will match, and as a result we never see this as income to be input in the spreadsheet. We could add OUR contributions onto our income each pay period, and then record the savings as our payment + employer contribution, but I don’t know if this will be truly reflective. 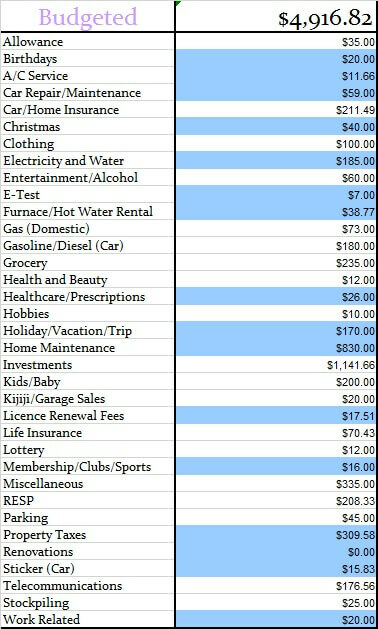 I appreciate any thoughts on how others keep tabs on these “expenses” that never we never really see in the first place. Thanks again for all you do! Good advice, I’m not good when it comes to budgeting too. I usually spent more than I set for one month. 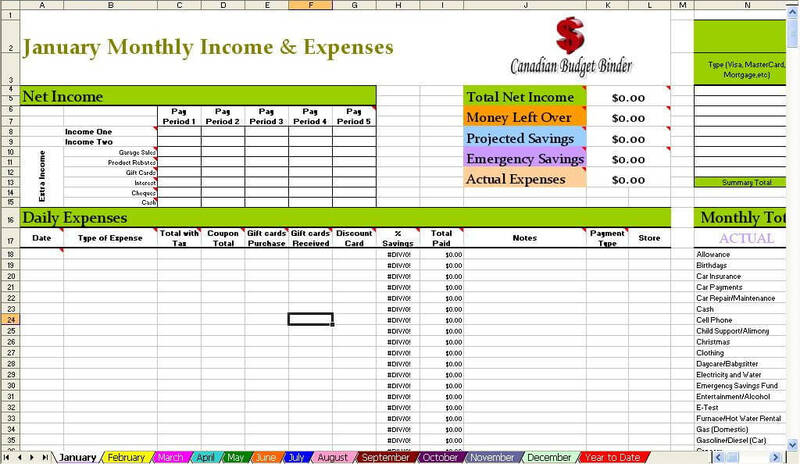 I just created a simple budgeting spreadsheet for me to review daily and I’m hoping that this one will work.